Follow in the footsteps of a nation's forefathers on this guided horse-drawn carriage tour through the cobblestone streets of historic old Philadelphia. Enjoy up-close, scenic views of the many attractions and landmarks. Hear a plethora of stories and commentary on the historical significance of each key site while traveling through Philly's busy streets. See the Liberty Bell, Independence Hall, the Betsy Ross House, and much more. 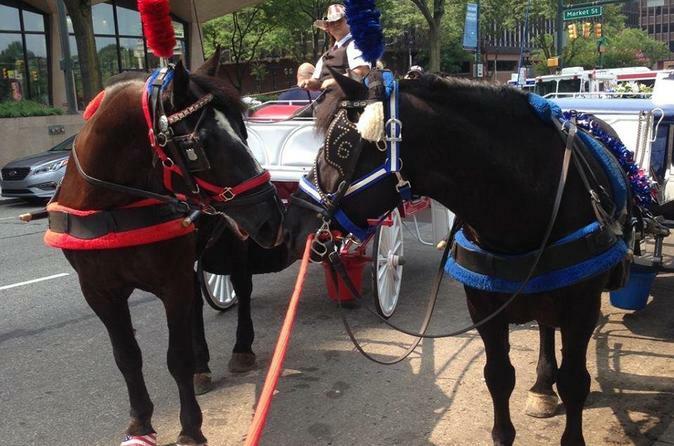 Sit back, relax, and experience Philadelphia's history and popular attractions on board a stylish, horse-drawn carriage. Travel back in time on an enchanting 45-minute or 1-hour carriage ride through the tree-lined streets of the 'City of Brotherly Love.' Along the way, the driver/tour guide will share stories behind every attraction, including Independence National Historical Park, the Liberty Bell, and Independence Hall. This historical tour departs from the carriage stand at 5th and Chestnut Streets. Travel to Society Hill, home to one of the largest selections of colonial homes as well as some of the oldest churches anywhere. Visit Old St. Joseph's Church, built in 1773, and the first Roman Catholic church in Philadelphia. Next, explore the Old City neighborhood, also known as America's most-historic mile. Tour the Betsy Ross House, where the legendary seamstress sewed the first American Flag. Visit Elfreth's Alley, the oldest-inhabited street in America, and then head to the Philadelphia Mint, Benjamin Franklin's grave at Christ Church Burial Ground, the National Constitution Center, and much more. The tour ends back at the original starting point — from the carriage stand at 5th and Chestnut Streets.